“Your cortada, señora,” the waiter says, placing the tiny coffee before me. Soaking up the atmosphere in a small Spanish plaza, it strikes me how lovely it is to be called señora. Far more exotic sounding than Ma’am or Mevrouw. Having visited three countries in a two week period, it’s been hectic. I have half-written blogs on the delights of Quebec City, Canada’s gem, and picture-perfect Netherlands. 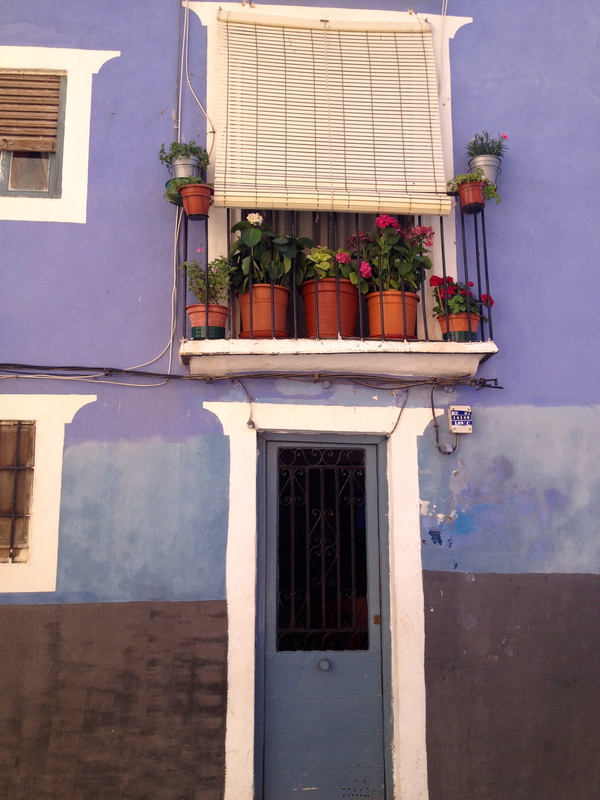 But for now…I’m smitten by Spain. 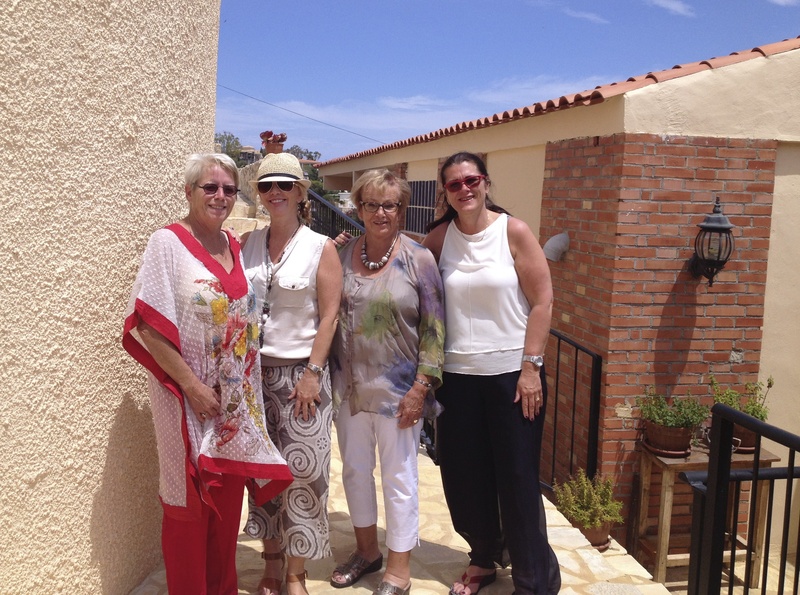 An unexpected trip with my mother and Dutch relatives has found us in the Alicante area, on the Mediterranean coast. Overlooking the Costa Blanca, we’re happily ensconced in a family villa. The terrace wraps around the long bungalow, leading to a ‘pool with a view’. We sunbathe and float, our gaze lingering on the sailboats and the fishing vessels beyond. The azure sea melds into the endless blue sky; I now understand why people adore Spain. Indeed, this is the good life on the Mediterranean. We indulge ourselves with moonlit swims and champagne lunches by the poolside, happy to drip-dry in our swimming suits and wraps. Our hosts, my second cousins Alda and Margienus, don’t permit us the luxury of afternoon siestas however. There’s too much to see, as Alda knows well. Her father acquired the villa some forty years ago. “I was about fifteen when we first came here for holidays. I feel some of my roots are here at Casalmar,” Alda told us as we feasted our eyes on the spectacular view for the first time. We soon appreciated why one would chose to vacation or live here. Villas crowd the coastline, bouganvila of fuscia, deep purple and crimson spilling over stone walls. Palm trees, cacti and giant aloe vera spring from the dry earth. Tiny corner stores and family run eateries seem to welcome on every street. Local markets sell the essentials for Spanish cuisine such as oranges, pimentos, chorizo, olives and rice. 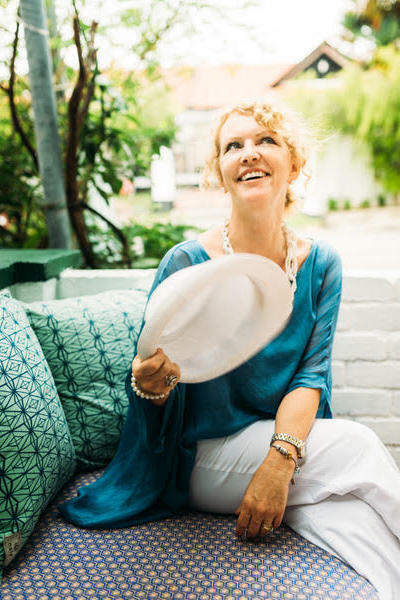 Fun, seaside attire entices us and we all come away with something; flouncy blouses, flowing pantaloons and billowy kaftans. But best of all, the sea is never far away. 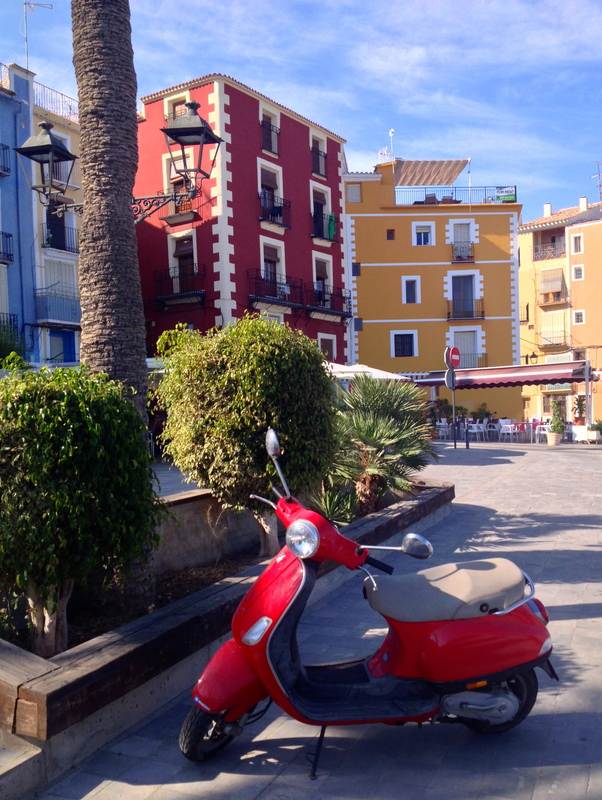 Our neighbourhood of El Campello is tranquil, yet comes to life on the promenade. Large intricate sandcastles guard the beach, children dig with bright spades and pile fine sand into plastic buckets. Bars welcome us with vistas of the waves lapping against the shoreline. Naturally, a 16th century watchtower catches my attention. The Alicante region wasn’t just a magnet for traders and settlers over the centuries, but also for the dreaded Barbary pirates or Ottoman Corsairs as they were also called. They plied the coast capturing local population, building their slave trade on Spanish captives. Some twenty defence towers still perch on prominent cliff tops; as if still watchful for the North African invaders. Some invaders came to stay and their legacy remains. The Moors over-ran southern Spain but brought enlightenment in the form of medical knowledge, irrigation and education. The coast also became a major Mediterranean trading station; rice, palms, olive oil, wool, wine and oranges. 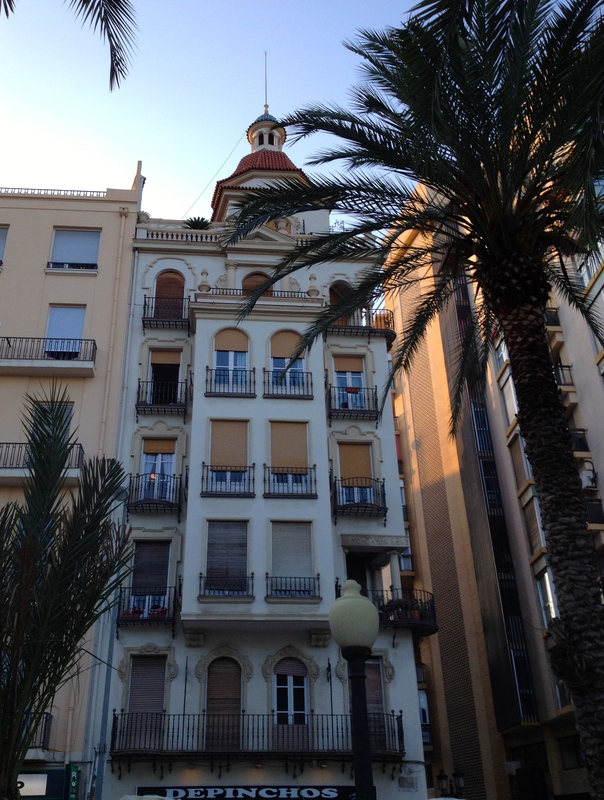 Valencia is further north and I can attest that the oranges are the tastiest you’ll ever try. And the wine? We sampled much of that as well; a delicious Spanish white costs no more than 2 Euros. It really is la dolce vita. Or should we say…la buena vida! One afternoon sees us enjoying a bottle of white in the picturesque town of Villa Joiosa. A short trip along the coast, its name means ‘jewelled town’. The vibrant colours are intended to guide local fishermen home from the sea. 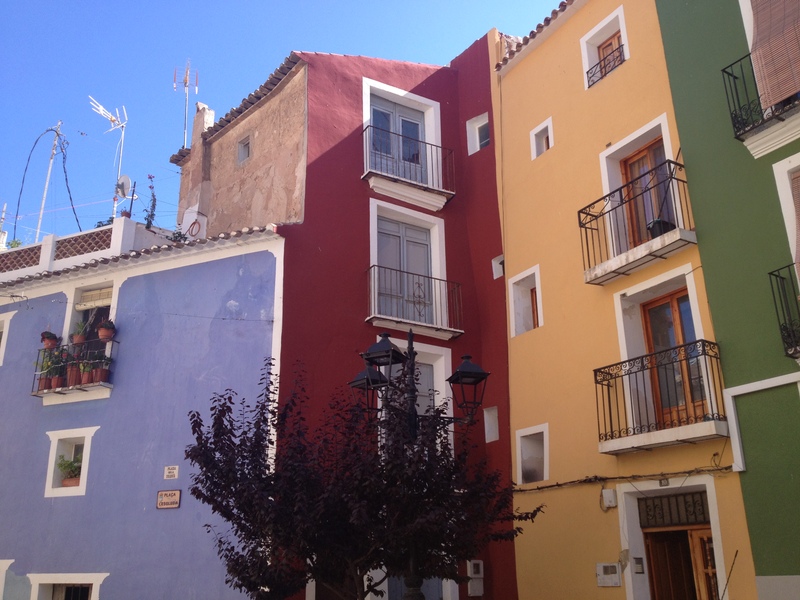 Narrow, centuries-old houses lean against each other, each distinctly hued. Shades of powder blues, reds, pale lavenders, yellows and seaside greens. Imagine selecting a handful of your favourite pencil crayons and living amongst them…it’s fanciful and alive, jewels every one of them. As we while away the late afternoon at the small Placa Castelar, the town awakens from its siesta slumber. Locals emerge from the warren of streets that radiate from the cobbled square. Church bells peal laconically, shop doors unlock, dogs stroll with their humans and hats tip to neighbours. We hear the the swish of blinds and shutters roll up. These outdoor coverings for doors and balconies are drawn down during siesta. It’s 5:30 now, time to come to life for the evening. 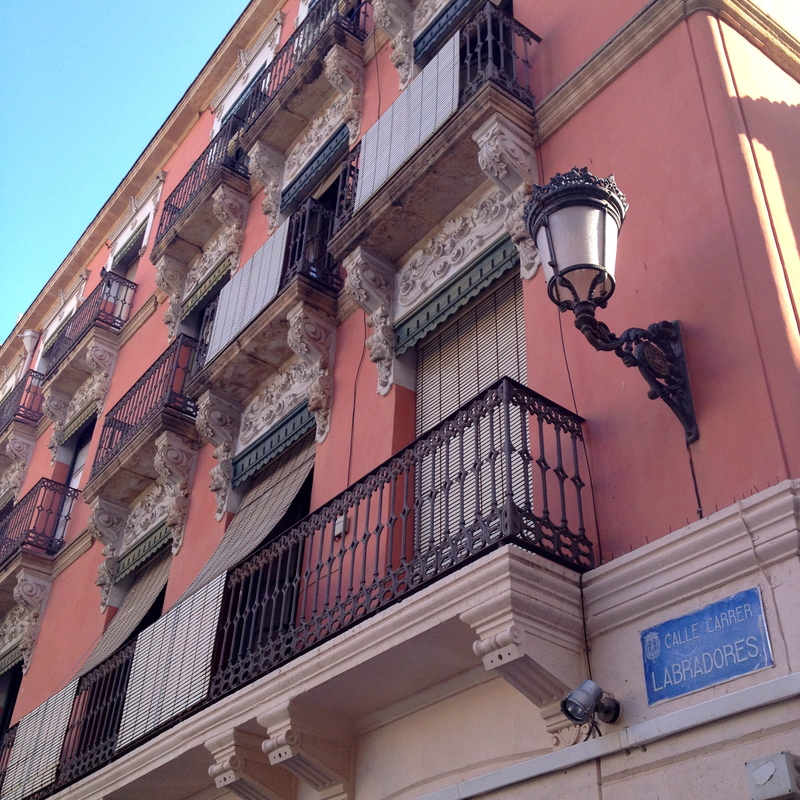 I notice a few señoras trickling water into terracotta pots on tiny balconies. ‘Hola’, they venture. I mention to Alda that we might peek into some shops back along the harbour. “I think you’ll want to wait for tomorrow,” she says and I remember what I’d read about Spanish shoes in Alicante. We begin our outing the next day (after a stop for the promised pair of Pikolinos) with a stroll along the heart and soul of the city, the Esplanada de España. 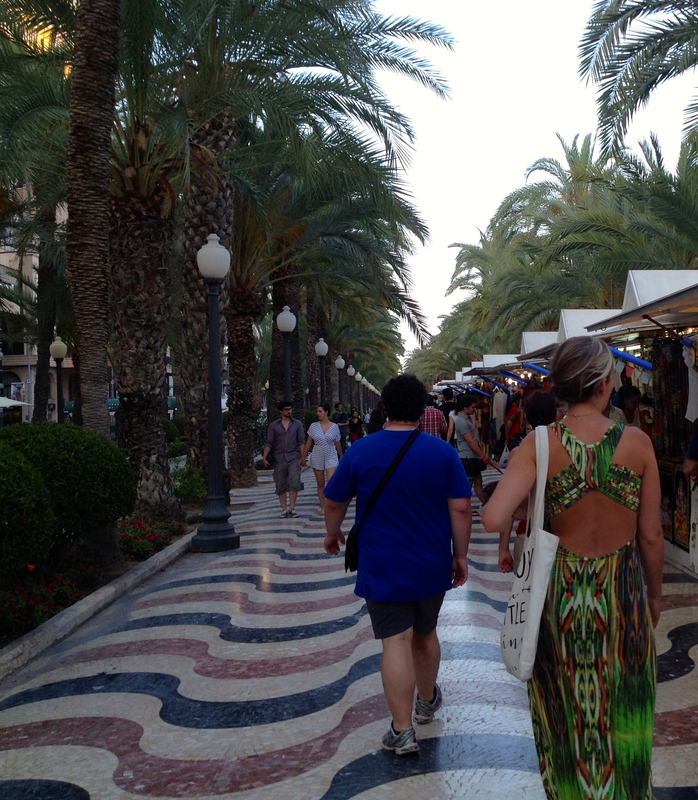 This grand boulevard stretches around the Alicante marina, all 6.6 million tiles of it; red, black and cream. Created in 1867, it offers the place for a perfect paseo, a romantic evening stroll. The dramatic marble tiles depict the waves of the Mediterranean and rows of palm trees offer shade. Well-dressed couples stroll hand in hand, people peruse the kiosks, others sip coffee. At a nearby bustling square we enjoy a cocktail and I befriend two charming waitresses, Maria and Katrina. 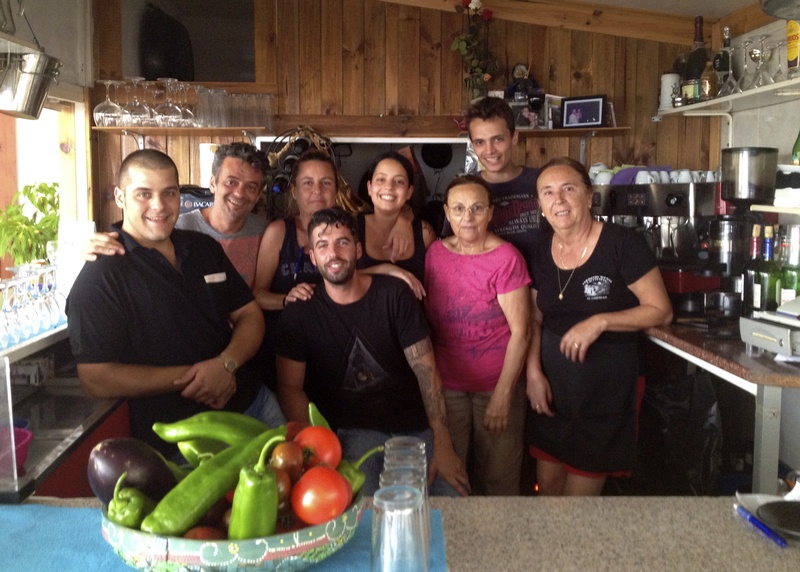 We chat and pose for photographs, their natural friendliness epitomizes the hospitality of Spain. After a first tapas at a nearby outdoor bar, we encounter them once again. Maria is standing in the elegant entrance of Le Turronena and I stop to ask the name of the imposing tree that shades the square. “It’s a dragon tree, there’s another famous one in Tenerife,” she informs me, then asks if we’ve come back to dine. “Well then come with me, I’ll take you to where you’re going next.” And with that Maria marches us down the street, shouts Hola to fellow shop workers as we pass, then turns a corner. We’re suddenly upon a crowd gathered outside a small tapas bar. 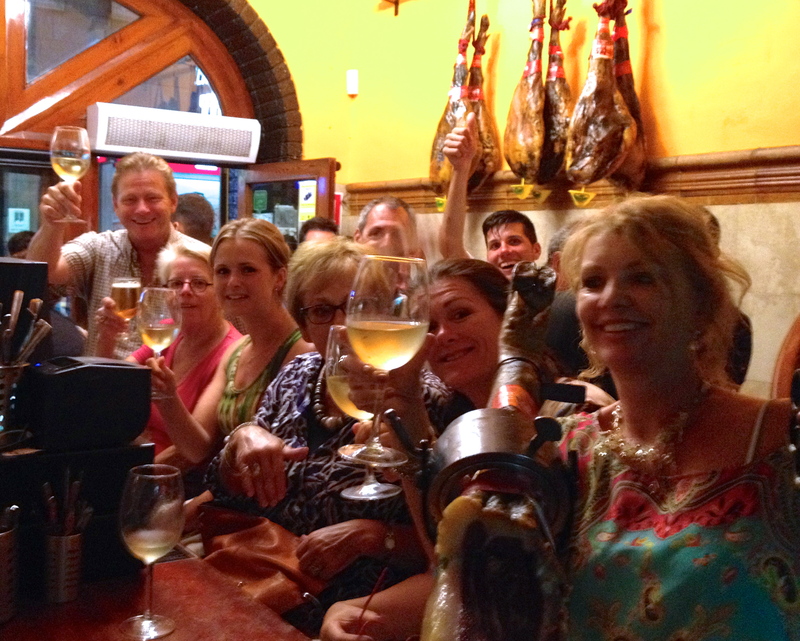 As custom dictates, many of the locals are outside socializing in the warm June evening, tapas in hand. 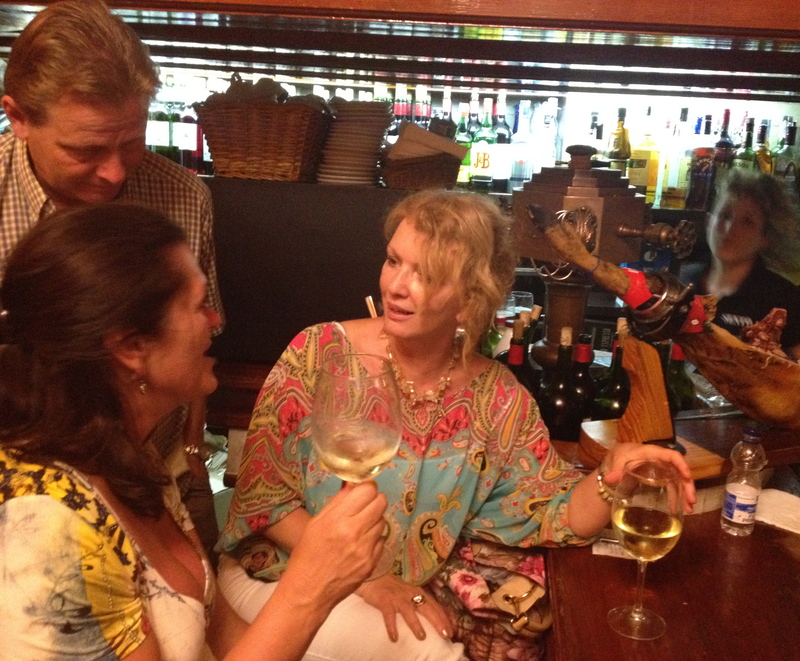 Maria informs one of the staff that she has a group of six and voila…we’re lucky enough to be seated at the bar. We know immediately that Maria is an angel in disguise. Alda had promised that we wouldn’t leave without an authentic tapas experience and this was it. The small bar is like a beehive; busy, exuberant and productive. Cured ham strung against mustard walls, tapas orders shouted out over the laughter and chat, staff weave in and out like a choreographed salsa dance. 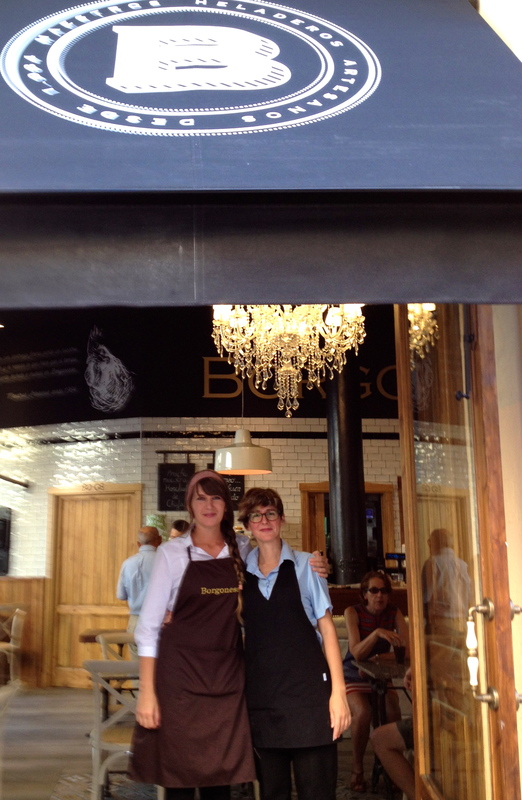 Each time their hospitality is rewarded with a tip, a loud clang erupts from a voluptuous bell behind the bar. “Fantastico!” one of the guys would sing-song and we in the bar would loudly echo it back. The ebullient Sara tells me it also means…”Our new friends are leaving and we hope they’ll come back.” I like that. As the wine flowed and sumptuous dishes are presented to us, it’s understandable that tapas has evolved into a sophisticated cuisine. Perhaps eight to twelve different dishes are savoured one by one, designed to encourage conversation. We sampled octopus, tuna, chorizo alvino, calamares and dishes in between. But the art of tapas has far more humble beginnings. It’s believed that since one would stand while eating a tapa in traditional Spanish bars, you’d need to place your plate on top of the drink to eat, making it a top. Others maintain the name originated sometime around the 16th century when tavern owners realized that the strong taste and smell of mature cheese disguised that of bad wine, so offered free cheese. Another theory is that King Alfonso X of Castile recovered from an illness by drinking wine with small dishes between meals. After regaining his health, the king mandated that taverns shouldn’t be allowed to serve wine to customers unless accompanied by a small snack or “tapa”, the meaning of the word. Then again, it’s said the same king once ordered a cup of wine on a windy beach. The waiter covered the glass with a slice of cured ham before offering it to the king, thus protecting the wine from sand. “I’ll have another, with the cover!” the king is said to have bellowed. He was onto something…in our opinion, wine and tapas go hand in hand. At one point in the evening, I ask Alda about her time spent here over the years. She fondly recalls shopping for a long gown, so she could stroll the esplanade as a teenager. That had been evident over the days as I heard Dutch and distinct English accents throughout the area. 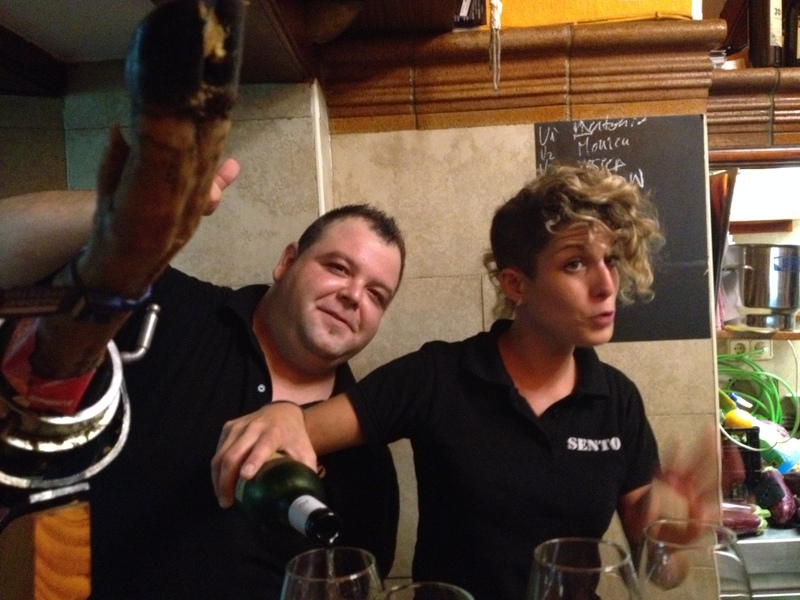 Yet while living a true Spanish experience in the tapas bar, Cervecería Sento, one’s home country is miles away. It’s difficult to imagine yourself anywhere else at that moment in time. My story might leave you in our favourite tapas bar, yet I must share one last vignette. Our last day finds us back in the village for a traditional Sunday lunch. To complete our culinary experience, Margienus insists we have traditional paella, the Spanish rice dish that originated in the Valencia area. We climb up a rocky hill where the restaurant sits, open to the breezy afternoon. Beach goers and picnics enjoy the sand below us, the day feels pleasant and timeless. No, it isn’t a fancy place, but the food and the family atmosphere is the attraction. Children play on the hillside and occasionally make their way to their parents who are enjoying yet another course and likely another bottle of wine. 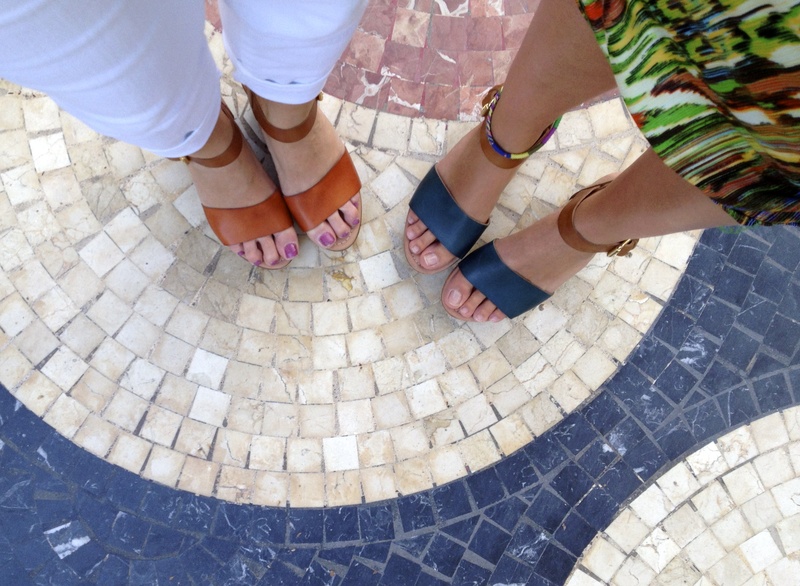 People wander up to the bar in bikinis or sit smartly dressed…and yes, the Spanish do craft beautiful shoes! We’re offered a small plate of a national dish from a generous local at the table next to us. We feel welcome and at home. Yet, I long to hear some Spanish music, you know how I am about these things. I ask one of the Thomas family members if they could indulge me. Generations of the family have welcomed the neighbourhood into their restaurant over the past forty years. On cue, a flamenco tune fills the restaurant. Now the experience is complete. The Spanish melody drifts past us, out towards the Costa Blanca. Really and truly, every Sunday afternoon should be like this. 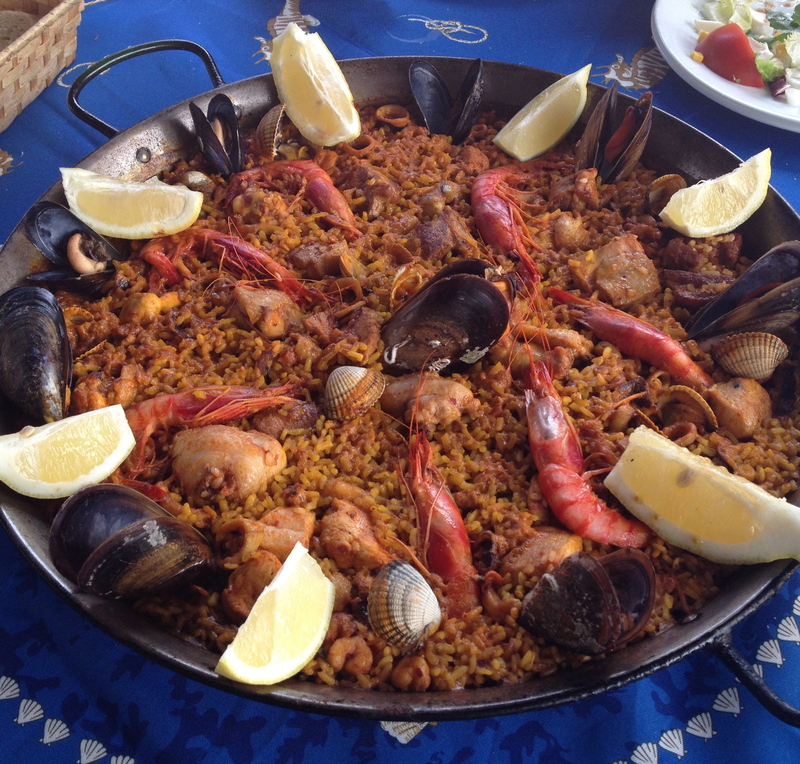 By the way, how was the paella? Like everything…it was Fantastico!